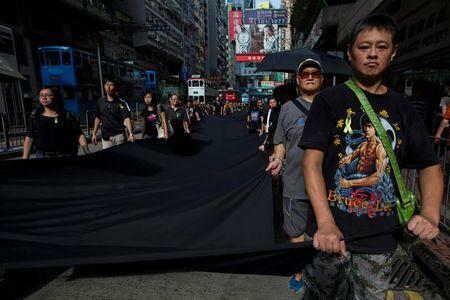 HONG KONG (Reuters) - Thousands of pro-democracy activists clad in black marched silently through Hong Kong on Sunday, holding banners saying they felt betrayed and angry at Beijing's refusal to allow fully-democratic elections for the city's next chief executive in 2017. 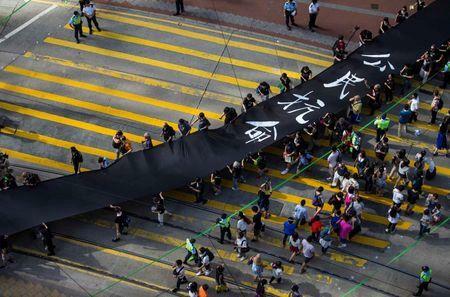 The protesters, who carried enormous black cloth ribbons through the streets, also held up signs calling for further civil disobedience and cheering on students planning to boycott classes. "Occupy Central with Love and Peace!" and "Support students boycotting classes!" read some of the signs. "Beijing has breached our trust! Universal suffrage is hopeless!" read another. Dozens of pro-establishment protesters gathered nearby waving banners and cursing the democracy activists and students. "Students should focus on studying!" shouted Pok Chun-chung, an organizer of the pro-establishment "Protect Hong Kong" movement. "If you adults have guts then you should occupy Central yourself, not use children as cannon fodder!" The protest remained peaceful and police stood by. Organizers estimated there were around 4,000 marchers at the height of the protest. Police estimated 1,860. Sunday's march was the latest in a series of confrontations between pro-democracy activists and pro-establishment forces over the extent to which Hong Kong may go ahead with democratic reforms. A former British colony, Hong Kong was returned to Communist Chinese rule in 1997 under a "one country, two systems" form of government. It was given wide-ranging autonomy, including an undated promise of "universal suffrage". Beijing this summer has made it clear it will not allow fully-democratic elections. Pro-democracy activists say China's decision to tightly control who can be nominated for the 2017 vote means Hong Kong risks ending up with a "fake" democracy. Earlier on Sunday, Hong Kong Chief Executive Leung Chun-ying published an open letter to residents of the special administrative region of China, urging them to be "pragmatic" and to form an "accurate and complete understanding of the constitutional and political context in which we find ourselves." He said constitutional reform should move forward whatever the pace, and that there could be additional reforms in the future. Amid escalating tensions, pro-democracy activists have held an unofficial referendum, mass marches and rallies and an overnight sit-in that lead to hundreds of arrests. A student boycott of classes is expected later this month, followed by another sit-in in the city's central business district.